We always get excited when we read stories about personal projects people undergo in their homes. It can be such a process to first even know when you want. Second, do you have the budget to implement what’s in your head? Third, do you have the time? When it finally comes time to put hand to hammer, hopefully you have a good idea about where the process will lead. It can be daunting looking at it from the beginning but it’s oh-so inspiring to see someone work towards a goal. In the end, it’s always worth it. Sometimes, it can turn out even better than imagined. That was certainly the case with this nursery. 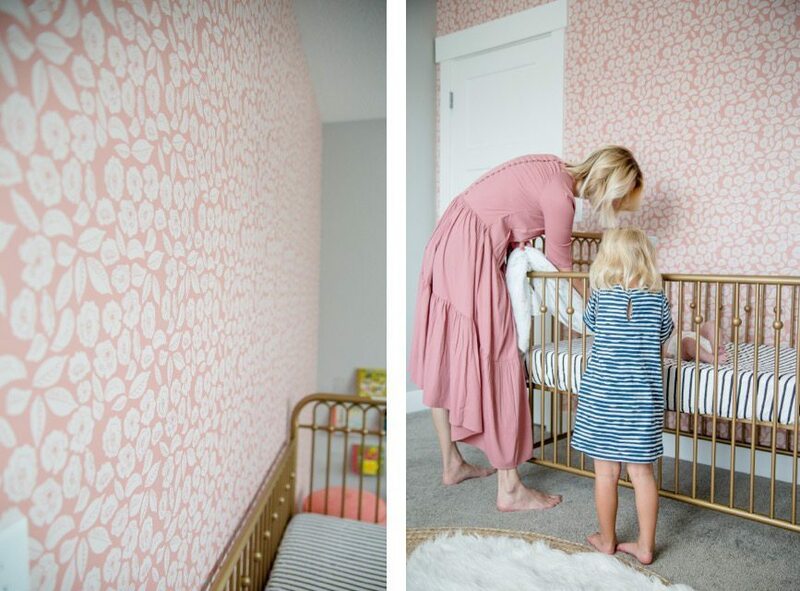 Robyn Meacham posted about her desire to make a nursery for her 4 month old baby girl, Remi. Robyn is a young wife and mother of two who is a Los Angeles transplant living in Utah. She frequently posts about her home-life and various projects on her blog TheSweetSimpleLife.com. Her older daughter never had a nursery growing up in their previous apartment. But now being a homeowner, she wanted to give little Remi a proper space. Robyn’s describes her direction as wanting something girly and classic. She also wanted to use items that she could use outside of the nursery down the road when a nursery was no longer needed. She used other items not pictured here like a basket, pouf and mirror from Target and a Let Love Grow sign from August and April. The crib is from Wayfair. We particularly love her choice in wallpaper. Robyn chose the Baby Bloom from the Love Mae Collection at Milton & King. All it took was one accent wall to bring some beautiful, soft and bright colour to the room. The design consists of soft, blooming flowers surrounded by delicate leaves. It’s the perfect colour and design, not only for a nursery, but for any child, particularly a young girl. This will accomplish Robyn’s goal of being able to use this for baby Remi and eventually for toddler Remi or maybe her older sister, Saylor. We think Robyn did a beautiful job creating a happy space to raise a happy baby. We are sure that so many beautiful moments and memories will be created in this nursery, little girl’s room or whatever it becomes as this beautiful family continues on life’s journey.